Front of the recipe card for Super Butterfinger Dessert. 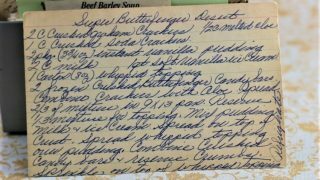 There are lots of fun recipes to read in the box this recipe for Super Butterfinger Dessert was with. Use the links below to view other recipes similar to this Super Butterfinger Dessert recipe. 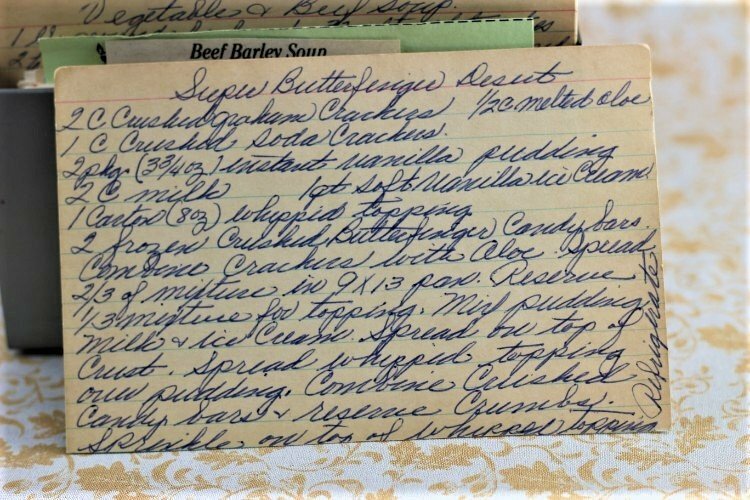 If you make this Super Butterfinger Dessert recipe, please share your photos and comments below! Spread 2/3 of mixture in 9x13 pan. Reserve ⅓ mixture for topping. Mix pudding, milk & ice cream. Spread on top of crust. Spread whipped topping over pudding. Combine crushed candy bars & reserve crumbs. Sprinkle on top of whipped topping.